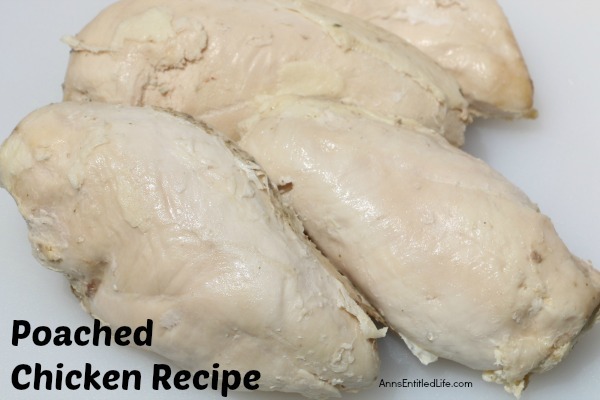 This is the best Poached Chicken Recipe ever! Poaching your chicken breasts will result in a tender, juicy chicken breast that can be used in many delicious recipes, or eaten alone. Poached chicken is much more flavorful than plain boiled chicken. 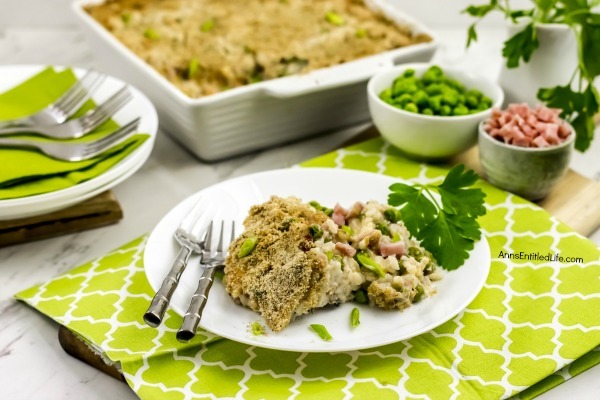 Versatile, easy to make poached chicken freezes well and is great to have on hand for lunch, dinner, or just a wonderful protein filled snack. • Combine onions, carrot, parsley, wine and garlic in a large stock pot. • Add enough water to cover the chicken (not yet in the pot) and all other ingredients. • Bring mixture to a simmer (you have not yet added your chicken). • Simmer 10 more minutes. • Remove from heat, strain into a large bowl and allow the liquid to cool. • Return the strained liquid to your stock pot. • Add the chicken to the pot, and cover. • Turn heat to high, and bring to a boil. • Boil for 1 minute, turn off the heat and allow the chicken to sit in the hot water for 15 minutes. • Allow poached chicken to cool in refrigerator. Many years ago, Hubby and I purchased 20# of chicken. Where we purchased had an issue with their truck, so we accepted one 10# box the discounted rate of 99¢# (boneless, skinless) for a box of frozen chicken. While it was bagged in 2-3# bags inside the box, we never made use of it. So, when we cleaned out one of the freezers a few weeks ago, hubby decided to defrost and poach. He ended up poaching 5# of chicken. We’ve poached chicken many, many times since that first poaching in 2011. Hubby uses poached chicken in what is his best recipe: Chicken Salad Recipe and it is phenomenal! While it doesn’t seem worth the time, I can’t emphasize enough how much better poached chicken tastes then plain old boiled chicken. 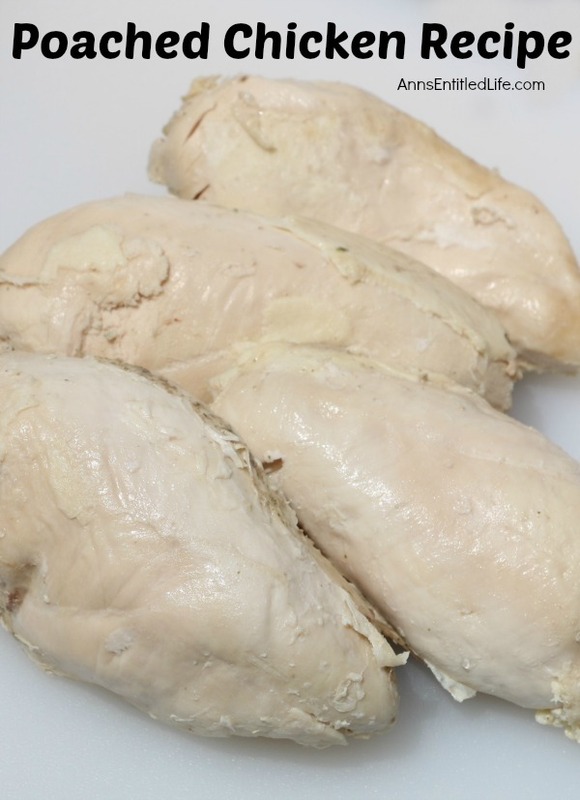 Do your recipes a favor (especially your chicken salads and cold chicken recipes), and poach some chicken today! Hubby will foodsaver the leftover poached chicken for later use. 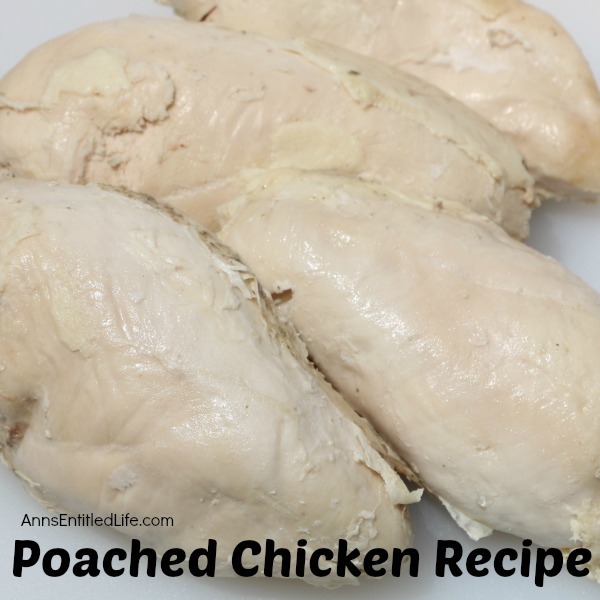 • To print the Poached Chicken recipe click here. • For more Recipe posts on Ann’s Entitled Life, click here. Got leftover ham? 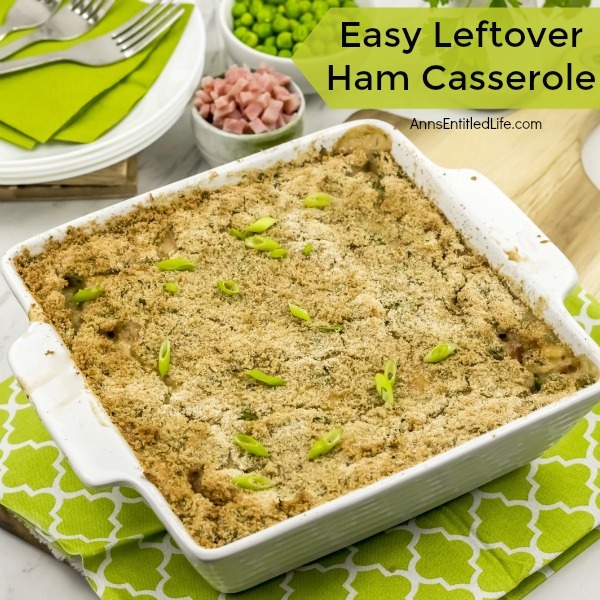 This is a delicious, easy to make leftover ham casserole recipe! 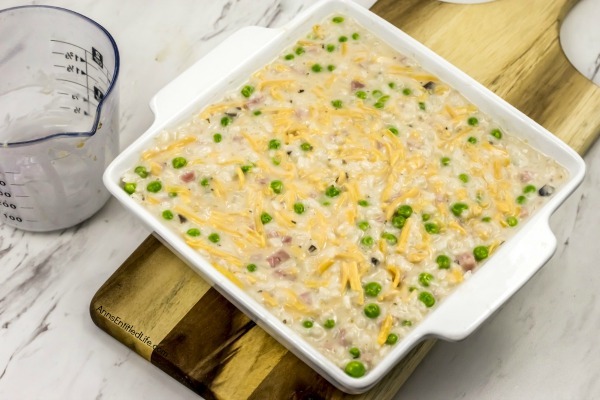 This homemade ham casserole freezes very well too. 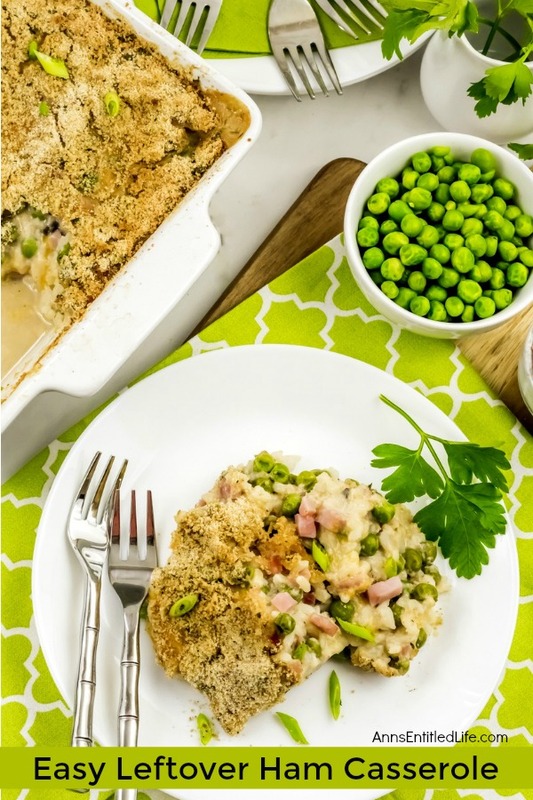 If you have leftover ham, try this simple to make ham casserole for dinner tonight! I make this recipe every single time we have leftover ham. I make one to eat, and at least one to freeze. Recently I have begun to double the recipe, add an extra cream of mushroom soup, and then freeze in smaller containers (I will divide a double recipe into three containers). It is just Hubby and me. I could probably do four containers, but I am worried about burning the top. In any event, it freezes very well. You do not bake before freezing. 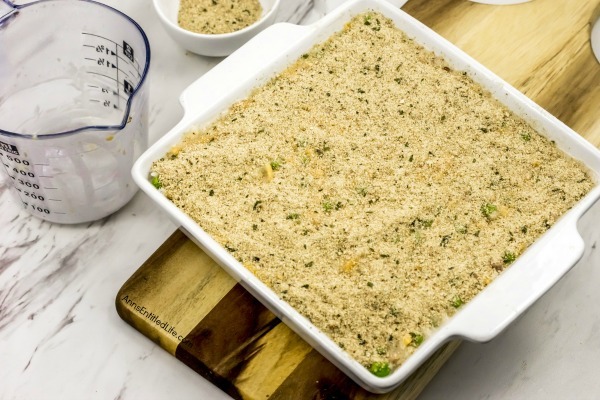 If you want to put the breadcrumbs on and then freeze you can (I usually do), or if you put them on before cooking when removed from the freezer, that is fine too. Why do I freeze with breadcrumbs on? I do not defrost. I simply pop it in a preheated oven and allow it to cook through until hot and bubbly. This is truly easy to make and comes together quickly. The “hardest” part is dicing up the ham (that is what Hubby is for!!) and remembering to cook some rice ahead of time (another good use of a leftover). • Mix cream of mushroom soup, cheese, and milk together. 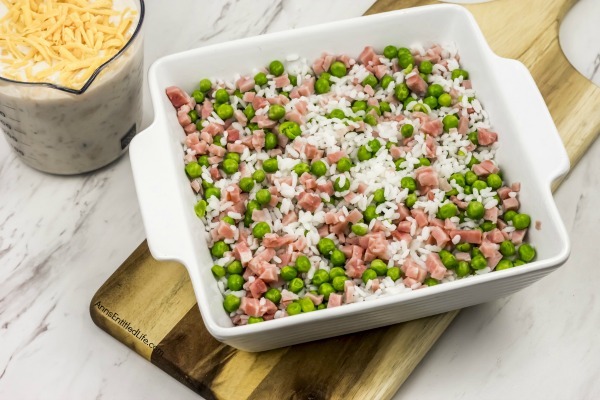 Pour over the layered rice, ham, and peas. 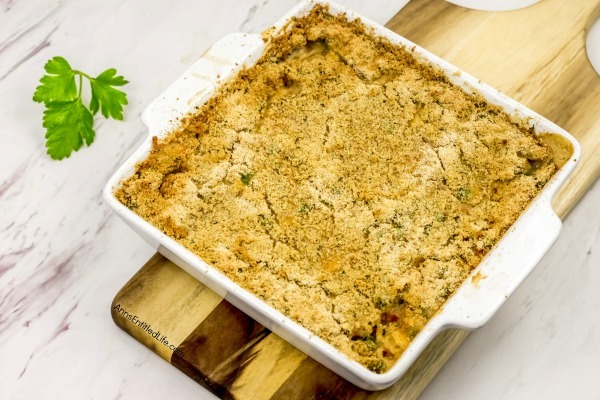 • Sprinkle with bread crumbs to top. • Bake for 45 minutes, or until hot and bubbly. 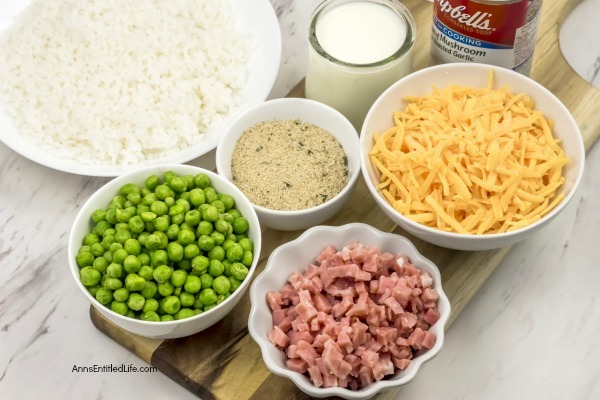 If you microwaved the peas before combining, this should be done in 40 minutes. 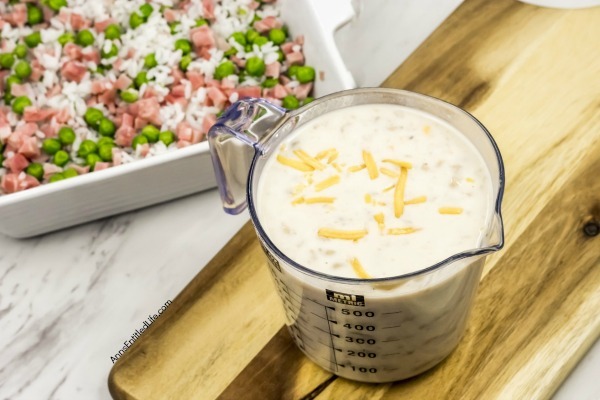 • To print the Ham Casserole Recipe, Ham Casserole click here. • Cuban Ham Sandwich Recipe – An easy, quick and simple variation of the traditional Cuban Ham Sandwich Recipe. This is a great use of leftover ham. • Ham and Cheese Stromboli Recipe – This delicious, easy to make, ham and cheese Stromboli is a great lunch, dinner, or party food. This can be cut into sandwich size portions for a few people, or cut into inch slices as a party food to help feed a crowd. 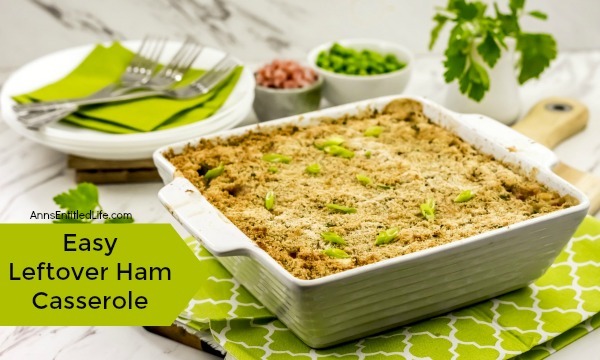 • Ham Casserole Recipe – Use up your ham leftovers to make this easy quiche recipe! Broccoli, ham, cheese, and mushrooms combine for an easy to make this flavorful, delicious and satisfying Broccoli and Ham Quiche. Breakfast, lunch or dinner, this versatile quiche dish is sure to please your entire family. • Ham Salad Recipe – Leftover Ham? This easy to make ham salad recipe is perfect for sandwiches, on a bed of lettuce or on crackers. As hors-d’oeuvres or meal, this ham salad is sure to please.